VATICAN CITY (CNS) — Christmas is the time to heal wounds and fix whatever defects still linger in one’s life and heart, Pope Francis told Vatican employees. 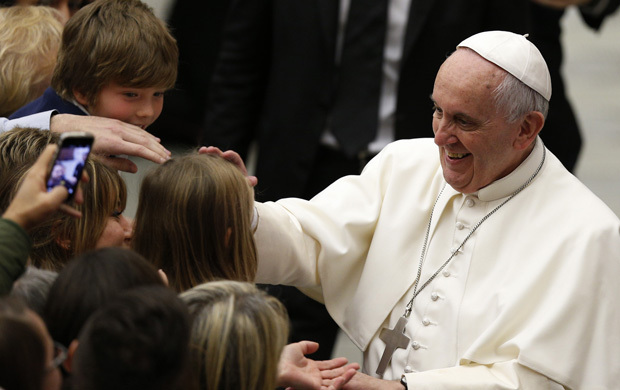 The pope’s comments came during a special audience in the Vatican’s Paul VI hall Dec. 22. It was the first time the pope invited everyone who works at the Vatican, along with their family members and loved ones, to receive the pope’s pre-Christmas greetings. In the past, popes have held smaller annual gatherings with certain groups, like the Vatican police force, for a moment of reflection and thanks. The pope continued to follow tradition with a pre-Christmas meeting earlier in the day with members of the Roman Curia — the church’s central administrative offices — as well as cardinals living in Rome and members of the papal household. However, Pope Francis said he wanted to show his thanks and appreciation for all those who serve the church behind the scenes at the Vatican. “I did not want to spend my second Christmas in Rome” without meeting the people whose hard work and dedication often go unnoticed, those who are “ironically defined as ‘the unknown, the invisible,'” like the gardeners, doormen and maintenance staff. He told the employees that he had spoken with their bosses about the importance of all the many and different members living as one harmonious body united in Christ. Everyone has a different and yet essential role to play, and sometimes “those parts of the body that seem the weakest are the most important,” he said. “Christians who do not nourish themselves with prayer, the sacraments and the Word of God inevitably shrivel up and run dry,” he said. “The family is a treasure, children are a treasure,” he said. He told everyone to ask themselves “Do I have time to play with my children or am I always busy and I have no time for them?” Playing with one’s kids is so important and “it’s so wonderful. It is sowing the seeds of the future,” he said. — Take care of letting go of all “rancor that leads us to revenge and from laziness” that causes a sort of “euthanasia” of one’s very being.